2. Add potatoes, onions, carrot, cabbage, green chilli paste, ginger garlic paste, garam masala powder and salt. 3. Stir well for a minute. 4. Add cheese cubes and combine well. 6. Make small balls of the mixture, flatten them lightly and roll them in breadcrumbs. 8. Cook the cutlets on both sides till golden brown and crisp. 9. Remove and serve hot with chutney or ketchup. 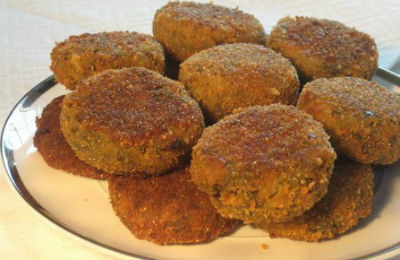 Feel free to comment or share your thoughts on this Cheese Veg Cutlet Recipe from Awesome Cuisine.